I’m interviewed by Adam McGovern in The Jack Kirby Collector #62. 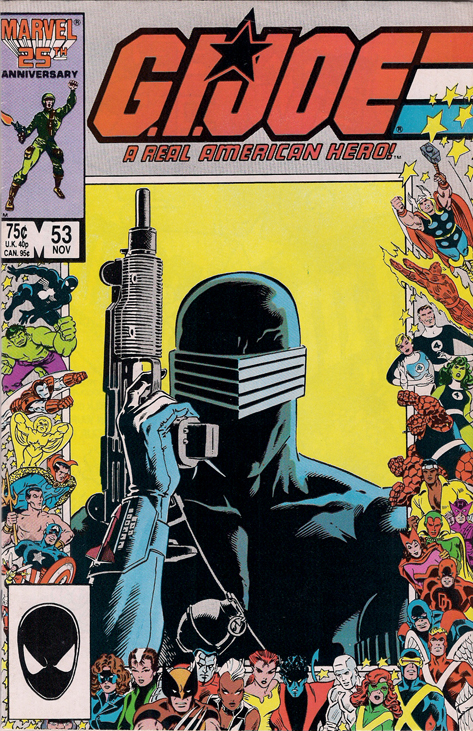 We talk about Transformers vs. G.I.Joe. The article is accompanied by a couple of my test images for the series, so it’s good to see how they look printed on a paper stock similar to what the actual comic is going to be printed on. 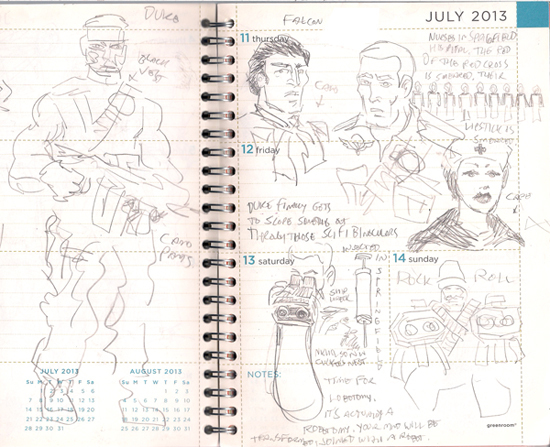 The editor makes a comparison between my G.I.Joe promo image and Kirby’s Cosmic NFL drawings. 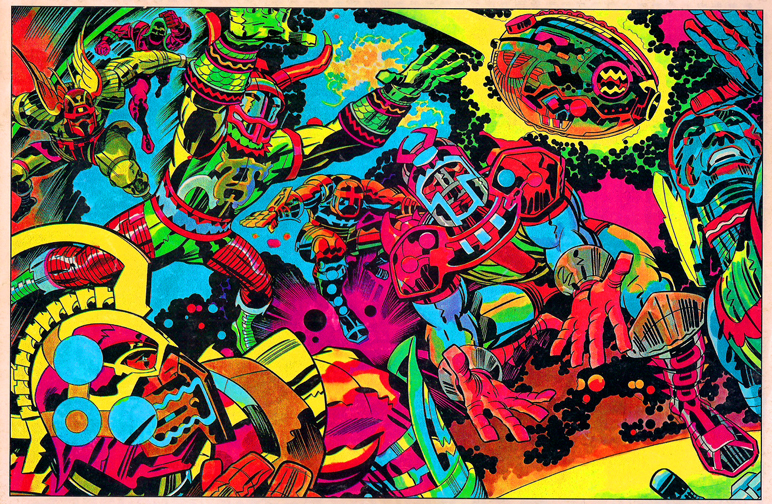 To me those images, hand-colored by Kirby himself, are the pinnacle of Kirby’s psychedelic cosmic god imagery. THOSE EYE-MELTING COLORS! Needless to say, I’m flattered by the comparison. 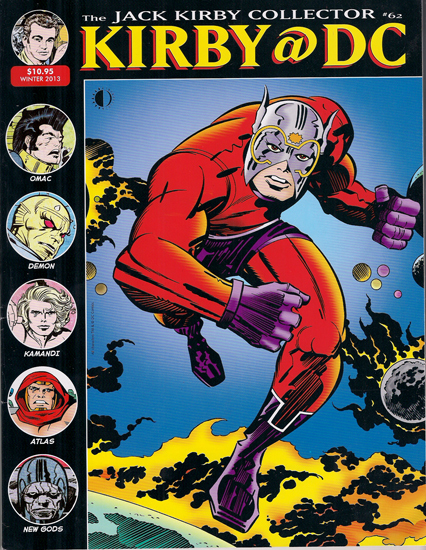 Speaking of colors, The Jack Kirby Collector recently made the switch from black-and-white to full-color printing. Kirby’s raw pencils and inked originals look amazing in full color high resolution production on glossy paper. Even his faded photocopies, made on one of the first commercial photocopier devices, take on a new depth. 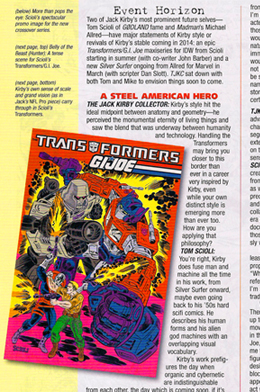 TJKC has been steadily carrying the Jack Kirby torch for almost 20 years (Sept. 1994). It continues to be instrumental in my Kirby education. I’ve just completed the artwork for the inaugural Free Comic Book Day issue of Transformers vs. G.I.Joe. I want nothing more than to share it with the world immediately, but it’s not a webcomic, at least not yet. 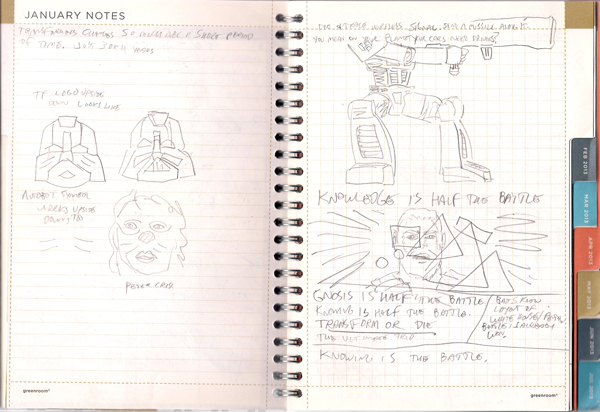 What I can share are the notes and sketches I did in preparation for working on this series. Below is what I thought was an original observation, that when turned upside-down the Autobot symbol bears a passing resemblance to Darth Vader or KISS’s Peter Criss. A quick search revealed that lots of people have made the same observation. I’ve been turning the G.I. Joe Public Service tagline “knowing is half the battle” around in my head, taking it apart, shuffling it around. As a child, I found those segments preachy and off-putting, but now I find that tagline to be rather profound and has different associations in this information-based economy we find ourselves in. 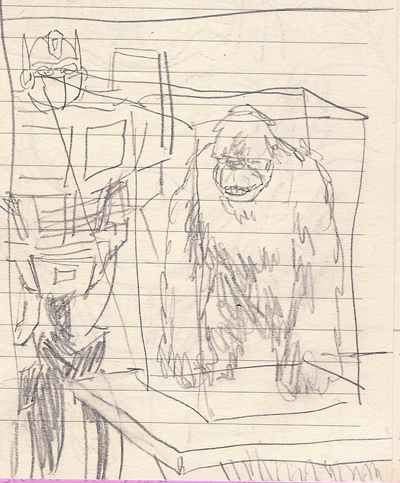 It could be a key element to figuring out how to make this story into something transcendent. As the 80’s turned into the 90’s the line of toys got stranger. They stopped making new episodes around this time, so I’ll never know if I stopped following it because I outgrew it or because the ongoing story of the Autobots and Decepticons ended. I liked the way the series jumped from a present day continuity to the year 2005. Had the TV series continued I would’ve enjoyed following the story of mankind’s relationship with living alien robots as it hurtled further and further into the deep future. I don’t know if these characters from the weird fringes of the Transformers mythology will find their way into the story, but it’s good to know the lay of the land. These things must be handled carefully, but I think it’s healthy for an imaginary universe to have as broad a range as possible, where anything can happen. What’s the point of a make-believe world incapable of genuine surprise? I remember a toy, a set of plastic armor that allowed you to become an Autobot. I’m considering using that design as the basis for a cybernetic armor worn by Autobot-allied humans in the story. Although it’s not the driving force of the project, some of the appeal for me is linking it to the parts of these mythologies that resonated with me as a child, and in a way continue to resonate with me. There’s a generational aspect to these things. There was a generation that really basked in the glow of Marvel superheroes and created compelling second-generation work with those characters that someone from the generation before and after would be incapable of for the reason that these characters did not resonate with them in the same way. I feel like something similar is happening with this project. I was 8 when these characters, toys and cartoons were new. They were of the moment, but as far as I knew, they could’ve been around for a thousand years. 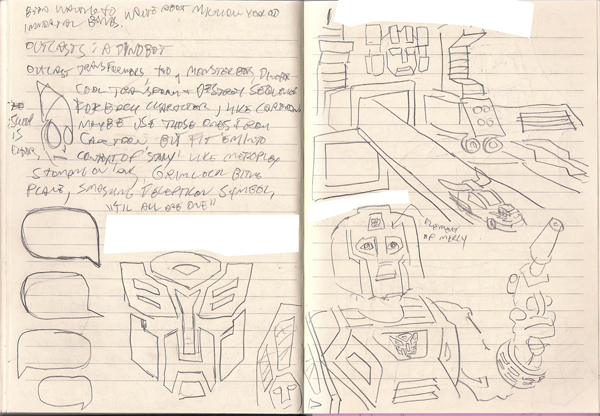 Here are some more sketches made during the research phase for Transformers vs. G.I.Joe. At this point in the process I’m riffing on the source material, getting a feel for the characters and generating the earliest bits and pieces of story elements. There are lots of different ways to draw Duke. The character with the beard is Mercer, the ex-Cobra-Viper who was one of Sgt. 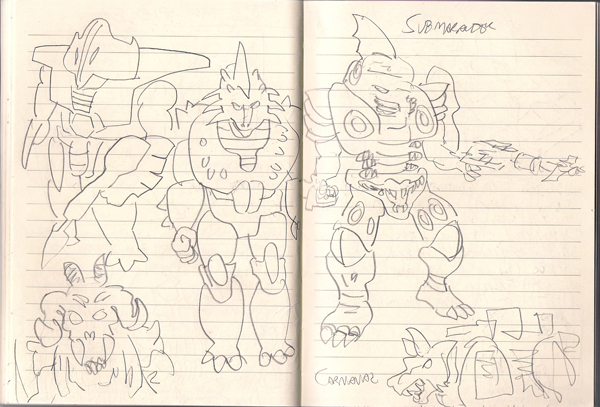 Slaughter’s Marauders. 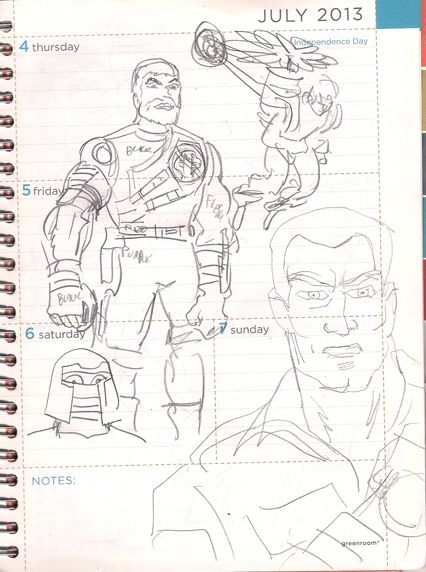 If you’ve seen the cover art to the Transformers vs. G.I.Joe Free Comic Book Day issue, you’ll see that the M.A.C. helicopter backpack made it in to the actual comic. Since there are comparatively few female Transformers, I’m trying to learn as much as I can about all of them. The “Peace Thru War” poster is from G.I. Joe #3. 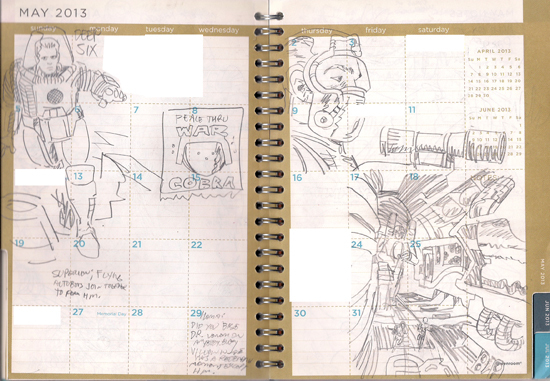 The two drawings on the right are riffs based on images in Jack Kirby’s 2001 #5, a comic that’s haunted me since I first discovered it at a flea market in the early 90’s. My alternate cover for Avengers 24 is out now. 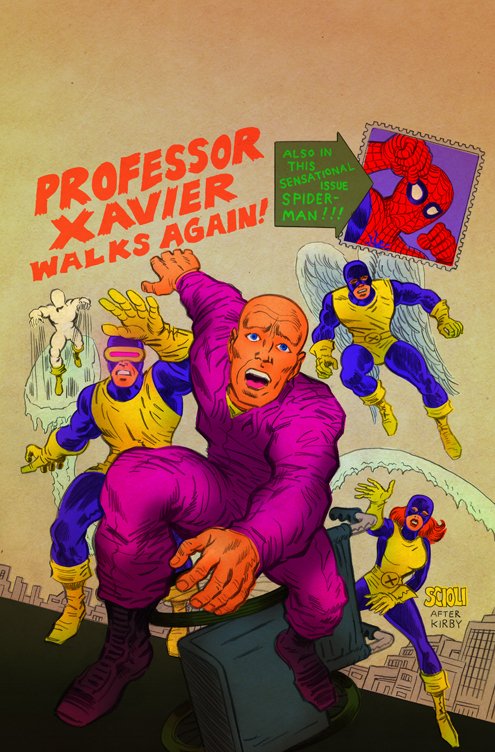 In a Christmas Eve miracle, Professor Xavier Walks Again!